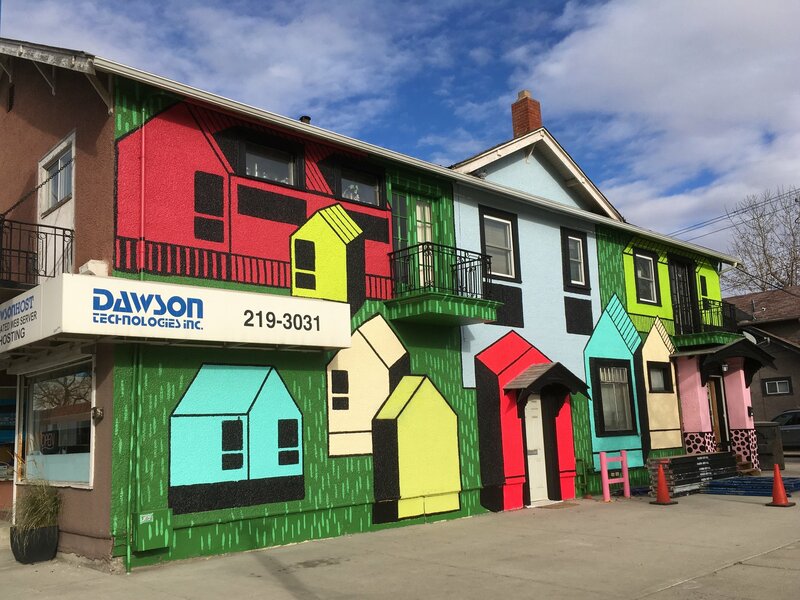 Crescent Heights Community Association is proud to be working with local mural artists, Kathryn Pearce and Tanner Hamilton, of Buds of Buds Collective, to produce and launch a community gateway mural and Calgary’s first augmented reality public mural. If you are driving north from Centre Street Bridge, you will see the mural at the corner of 8th Avenue and Centre Street North on the south-facing wall of Ducktoes Computer Services (902 Centre Street N) . The artists were selected through a jury process comprising of a Crescent Heights artist, business owner, CHCA board member and the property owner. Augmented Reality (AR) adds graphics, sounds, touch and feedback into what we already see in front of us, through a device like an app on your phone. AR uses an existing display and overlays virtual information on top of it. Animated Snapchat filters are a great example. Anyone with a smartphone can participate. The mural is titled “Won’t You Be My Neighbour!” and can be viewed using the Augle app to experience the augmented reality portion. This technology will be officially available at the mural community launch date on November 24, 2018, at 1 pm at 902 Centre Street NE.